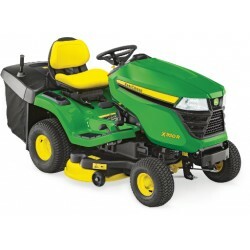 The new Lawn and Garden range from John Deere is here, take a look at the Easy to Own. Easy to Operate. Easy to Maintain. The X126 Lawn Tractor. The John Deere X126 Ride-On lawn Mower combines exceptional dependability, durability and power into every aspect of its construction. This includes a fully welded steel frame and cast iron front axle. Operating the X126 mower is also a breeze, with an ergonomic operator station, quality headlights, and an infinite choice of ground speeds.